It’s the Charleston Area Alliance Annual “We Love our Community Awards” Event! This year sponsored by Spilman Thomas & Battle. 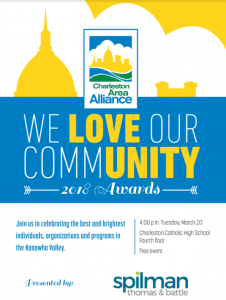 The We Love Our Community Awards Program will take place on Tuesday, March 20, 4:00 pm in the Krupa Annex (4th floor) of Charleston Catholic High School. The CAA will honor 13 people, projects, programs and organizations that make Charleston such a great place to live, work and play. Award recipients range widely, from outstanding preservation and development projects, to groundbreaking community celebrations and those making a positive impact on the quality of life of the community. The event is FREE to attend. There is no charge to attend thanks to our premiere sponsor Spilman Thomas & Battle PLLC. For more information contact Susie Salisbury at 304-340-4253. PreviousPrevious post:Kanawha Communities That Care to Host Syringe & Needle Clean-up On March 17thNextNext post:Do You Remember When You First Knew Yourself?